Text © Copyright January 2019, JThomas; licensed for re-use under a Creative Commons Licence. Class 170 Turbostar is a class off Diesel Multiple Units (DMU's) that were built by Adtranz and later Bombardier Transportation at their Derby Litchurch Lane Works between 1998 and 2005. Each unit is constructed of welded aluminium with steel ends. They are mainly utilised by the train operating companies on regional and long-distance services. They have a maximum speed of 160kph (100 mph). Each car is 23.62 m long (77 ft 6 in).122 trainsets were built. 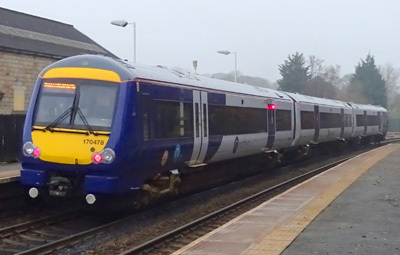 Post-privatisation of British Rail, Class 170 was the first new train type to be introduced. The class has been categorised into six sub-classes. The basic specification of engine, length and transmission are the same throughout the class, the only differences being the interior seating layouts and fitments.